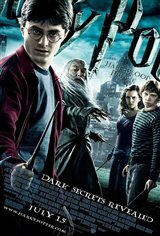 When Harry Potter and his best friends, Ron Weasley and Hermione Granger, return to Hogwarts School of Witchcraft and Wizardry for their sixth year of magical education, they're unhappy to learn that Severus Snape has been promoted to Defence Against the Dark Arts instructor, while Horace Slughorn has been convinced after much persuasion on Dumbledore's part to take Snape's place as Potions teacher. Dumbledore needs Harry to help him uncover a memory that exists within Professor Slughorn. They need to see it if they are to successfully fight Lord Voldemort's dark forces. Meanwhile, Harry becomes the top student in his potions class, due to the extra instructions written in ink in his text book by someone who identifies himself only as "The Half-Blood Prince." Dumbledore takes Harry on an expedition to find a magical object called a Horcrux and destroy it after they find out that Voldemort has separated his soul into seven pieces and hidden them within these objects. If they can find all the pieces of Voldemort's soul and destroy them, they'll be able to defeat the dark lord and save the wizarding world.